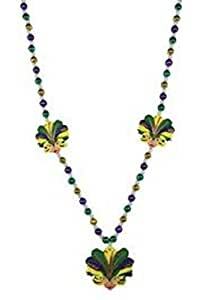 Mardi Gras, Feathered Mask Lady Beads, Necklace, 42″, 3 Pack (3pcs). Mardi Gras, Feathered Mask Lady Beads, Necklace, 42″, 3 Pack (3pcs). 42in long purple, green, gold, and faux pearl bead necklace. This hand-strung specialty necklace has 3 poly-stone medallions depicting a lady’s face wearing a feathered mask. The mask’s feathers are purple, green, gold, and yellow.